فرزین آبده گاه, احسان. (1397). Auto-Ethnography: “Employee Behavior Towards Supervisors and Managers” Or “Interaction as the Ideal Behavior”. مطالعات رفتار سازمانی, 7(1), 163-184. احسان فرزین آبده گاه. "Auto-Ethnography: “Employee Behavior Towards Supervisors and Managers” Or “Interaction as the Ideal Behavior”". مطالعات رفتار سازمانی, 7, 1, 1397, 163-184. فرزین آبده گاه, احسان. (1397). 'Auto-Ethnography: “Employee Behavior Towards Supervisors and Managers” Or “Interaction as the Ideal Behavior”', مطالعات رفتار سازمانی, 7(1), pp. 163-184. فرزین آبده گاه, احسان. Auto-Ethnography: “Employee Behavior Towards Supervisors and Managers” Or “Interaction as the Ideal Behavior”. مطالعات رفتار سازمانی, 1397; 7(1): 163-184. Before managing the staff in dealing with supervisors and managers, it is necessary to recognize types of behavior they exhibit. This has not been previously analyzed through concise research. Using Analytic Auto-ethnography can help us to provide a model based on two indicators of courage and adaptability, which can be low, medium or high. Four main types of employee behaviors towards supervisors and managers will be examined in this study and other less analyzed behaviors will be examined in future research. Within the framework of this model, great courage and low adaptability leads to aggressive employee behavior towards supervisors or managers, courage and great adaptability to staff interaction with supervisors or managers, courage and low adaptability to vilifying, and a low courage and great adaptability results in staff ingratiation in dealing with supervisors or managers. Desirable treatment is the interaction that comes from the loyal staff. Ackoff, RL. (1999a). Ackoffs Best: His Classic Writings on Management. John Wiley and Sons, New York. Ackoff, RL. (1999b). Re-creating the Corporation: A Design of Organizations for the 21st Century. Oxford University Press, New York. Adler, PA. & Adler, P. (1987). Membership Roles in Field Research. Newbury Park, CA: Sage. Aguinis, H. (2002). Estimation of Interaction Effects in Organization Studies. Organizational Research Methods, 5 (3), 207-211. Aguinis, H., Beaty, JC., Boik, RJ. & Pierce, CA. (2000). Statistical power of differential prediction analysis: A30-year review. In: FL Oswald (Chair) Differential prediction in personnel selection: Past, present, and future. Symposium conducted at the meeting of the Society for Industrial and Organizational Psychology. New Orleans, LA. Alan Fine, G. & Hallett, T. (2014). Group Cultures and the Everyday Life of Organizations: Interaction Orders and Meso-Analysis. Organization Studies, 35(12), 1773–1792. Anderson, L. (2006). Analytic Auto ethnography. Journal of Contemporary Ethnography, 35 (4), 373-395. Barley, S. (2008). Coalface institutionalism. In: Greenwood R, Oliver C, Suddaby R & Sahlin-Andersson K (Eds) The Sage handbook of organizational institutionalism. Newbury Park, CA: SAGE Publications, 490–516. Baron, RA. & Richardson, DR. (1994). Human aggression. New York: Plenum. Boxx, R. (2007). Avoiding the pitfalls of false ingratiation. Available at: http://193.2.241.139/poslovnitok/view/mm/i/55. Boylorn, RM. (2006). E pluribus unum (out of many, one). Qualitative Inquiry, 12(4), 651-680. Chang, H. (2008). Auto ethnography as method. Walnut Creek, CA: Left Coast Press. Creswell, J. (2007). Research design: Qualitative and quantitative approaches. Thousand Oaks, CA: Sage. Davies, CA. (1999). Reflexive ethnography: A guide to researching selves and others. London: Routledge. Elahi, T. & Pourheravi, H. (2008). The role of employees in the organization and interaction with management staff. Tehran. Paike Noor Press, 21, 163-171. 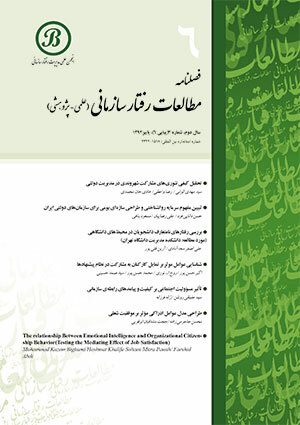 Available at: http://www.noormags.ir/view/fa/articlepage/335978. Ellis, C. (2002b). Shattered Lives: Making sense of September 11th and its aftermath. Journal of Contemporary Ethnography, 31(4), 375-400. Ellis, C. (2004). The ethnographic I: A methodological novel about auto ethnography. Walnut Creek, CA: Alta Mira Press. Ellis, C,. Adams, TE. & Bochner, AP. (2011). Auto ethnography: An overview. Forum: Qualitative Social Research, 12(1). Fazeli, N. (2012). Auto ethnography. Institute for Humanities and Cultural Studies. Available at: http://farhangemrooz.com/download?ts=1428991313000&f=2014/10/18/0/12611.mp3. Fligstein, N. (2001). Social skill and the theory of fields. Sociological Theory, 19, 105–125. Gandz, J. & Murray, VV. (1980). The Experience of Workplace Politics. Academy of Management Journal, 23, 237–251. Goodall, HL Jr. (2000). Writing the new ethnography. New York. NY: Alta Mira Press. Graham, K., Tremblay, PF., Wells, S., Pernanen, K., Purcell, J. & Jelley, J. (2006). Harm, Intent, and the Nature of Aggressive Behavior Measuring Naturally Occurring Aggression in Barroom Settings. Assessment, 13 (3): 280-296. Hallett, T. & Ventresca, M. (2006). Inhabited institutions: Social interactions and organizational forms in Gouldner’s Patterns of Industrial Bureaucracy. Theory and Society, 35: 213–236. Iqbal, A., Tufail, MS. & Lodhi, RN. (2015). Employee Loyalty and Organizational Commitment in Pakistan Organizations. Global Journal of Human Resource Management, 3(1):1-11. Available at: www.ea-Journals.org. Jackson, MC. (2003). Systems Thinking, Creative Holism for Managers. John Wiley and Sons, Chichester, UK. Jap, S. & Anderson, E. (1998). Vilification dysfunctional dynamics in inter organizational collaborations. Working Paper 99/06/MKT, INSEAD, Fontainebleau, France. Karp, D. (1996). Speaking of sadness. New York: Oxford University Press. Kumar, K. & M, Beyerlein. (1991). Construction and validation of an instrument for measuring ingratiatory behaviors in organizational settings. Journal of Applied Psychology, 76: 619–627. Maturana, HR. & Varela, FJ. (1980). Autopoiesis and Cognition: The Realization of the Living. D. Reidel, Dordrecht, The Netherlands. Ouellet, LJ. (1994). Pedal to the metal: The work lives of truckers. Philadelphia: Temple University Press. Palich, LE., Cardinal, LB. & Miller, CC. (2000). Curvilinearity in the diversification-performance linkage: An examination of over three decades of research. Strategic Management Journal, 21: 155-174. Park, SH., D. Westphal, J. & Stern, I. (2011). Set up for a fall: The Insidious Effects of Flattery and Opinion Conformity toward Corporate Leaders. Administrative Science Quarterly, 56 (2)257–302. Pellegrini, F. (2002). Person of the week: “Enron Whistleblower” Sheron Watkins. Available at: http://www.time.com/time/nation/article/0,8599,194927,00.htm. Accessed on October 1, 215. Porter, LW., Lawler, EE. & Hackman, JR. (1975). Behavior in organizations, New York: McGraw-Hill. Poulos, C. (2008). Narrative Conscience and the auto ethnographic adventure: Probing memories, secrets, shadows, and possibilities. Qualitative Inquiry, 14(1): 46-66. Project Management Institute. (2015). A Guide to the Project Management Body of Knowledge: PMBOK(R) Guide. Fifth Edition. An American National Standard. Raab, D. (2013). Transpersonal Approaches to Auto ethnographic Research and Writing. The Qualitative Report 18(42): 1-18. Available at: http://www.nova.edu/ssss/QR/QR18/ raab42.pdf. Rezaeian, A. (2000). Management and organizational behavior. Science and Literature Press. fifth printing. Tehran. Smith, C. (2005). Epistemological Intimacy: A Move to Auto ethnography. International Journal of Qualitative Methods, 4(2, Article 6). Available at: http://www. ualberta.ca/~ijqm/backissues/2004_2002/pdf/smith.pdf. Sparkes, AC. (2000). Auto ethnography and narratives of self: Reflections on criteria in action. Sociology of Sport Journal, 17(1): 21–43. Stevens, A. & Lavin, D.O. (2007). Stealing Time: The temporal regulation of labor in neoliberal and post-Fordist work regime. Democratic Communique, 21(2), 40-60. Taber, N. (2010). Institutional ethnography, auto ethnography, and narrative: an argument for incorporating multiple methodologies. Qualitative Research, 10(1): 5–25. Tracy, S. (2010). Qualitative quality: Eight big-tent criteria for excellent qualitative research. Qualitative Inquiry, 16(10): 837–851. Van-Maanen, J. (2011). Tales of the field. Chicago, IL: The University of Chicago Press. Vigoda-Gadot, E. & Drory, A. (eds). (2006). Handbook of Organizational Politics. Cheltenham: Edward Elgar. Vonk, R. (2002). Self-serving interpretations of flattery: Why ingratiation works. Journal of Personality and Social Psychology, 82: 515–526. Walford, G. (2004). Finding the Limits: Autoethnography and Being an Oxford University Proctor. Qualitative Research, 4(3): 403–17. Zanzi, A. & O’Neill, RM. (2001). Sanctioned Versus Non-Sanctioned Political Tactics. Journal of Managerial, 13 (2): 245–262.